And since the image won't allow you to magnify it for some reason, here are some details as well. In all seriousness, I'm really happy with how this turned out. This class provided me with a great opportunity to really dive into some vector illustration, since it's not part of my usual workload. It's been stupendously fun and I've learned a lot as well. Endless thanks to Dan and Nathan for teaching this awesome course, and to Skillshare for hosting it. Alrighty, pretty sure I now have my type figured out. It's lookin' like this. Now for some final tweaks & cleaning up my file. Should be uploading the final pretty soon. And 3 colors looks even better. Here's a glimpse of my progress. Thinking about taking out the hot pink to tone it down a bit, but more on this later. Type: So this is by no means the final typography, but this is what I'm thinking as far as hierarchy, placement, color. And by color, I mean I like the idea of the copy being white. I think having some of the copy outlined with no fill with the design showing through would be a nice addition too. More on this later. Here's some of my reference imagery for the illustrations. More to come soon. Decided to go with 13"x19" since that's the print size I have access to. And here's the final kaleidoscope layout. I really liked some of the kaleidoscope images I found where it refracted infinitely in the center, and I foresee that handling the copy in the center well. This is how the color palette is looking. Most likely going with 3-all 5 of these. 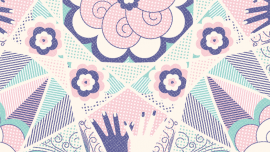 Now I'm starting to illustrate some hands, feathers, & flowers in illustrator. Because of the symmetry of the format, I'll need to just do one cross section of the layout, and then reflect that throughout the rest of the composition, so I'm goin there now. Color: So in some interviews Alex was called an "indie pop darling" and someone referred to her music as "sugary". She also has a very retro feel to the way that she dresses, which is why I'm going all sweet pastels on this all the way. Here's some of my color inspiration. This idea is particularly suited to Alex's music because of the toylike musicbox sound her music has. The faceted format is also just really visually interesting as far as symmetry and refraction goes. I also realized that the event information can play to that same kind of visual symmetry in terms of character lengths, not to mention this is a great format to incorporate some sweet lettering. I'm planning on filling the facets with some jazz hands since Alex whips those out in a bunch of her videos (especially all the gesturing in the Velvet Elvis video), peacock feathers, and some tropical flowers since those both speak to the exotic quality of her sound. And just to check that I could start to figure this facet business out, I went here. So I'm not quite as hyped about this concept, but it centers on Alex's song "Locomotive", the driving beat of her music, and her iconically/obnoxiously side-parted long hair. So essentially it's a locomotive chugging along into the foreground, and the smoke coming from it–combined with the skyline– makes Alex's portrait in the sky. I love the poppy musicbox quality of Alex's music, and the fact that she's a classically trained opera singer. King Con is definitely one of my top albums of 2012. Getting pumped about this.